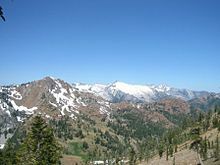 The term Coast Range is used by the United States Geological Survey to refer only to the ranges south of the Strait of Juan de Fuca in Washington to the California-Mexico border; and only the ranges west of Puget Sound, the Willamette Valley, the Sacramento and San Joaquin valleys (the California Central Valley). That definition excludes the Sierra Nevada and Cascade Ranges, the Mojave (High), and Sonoran (Low) Deserts. i.e. the Pacific Border province. 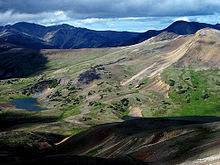 The same term is used informally in Canada to refer to the Coast Mountains and adjoining inland ranges such as the Hazelton Mountains, and sometimes also the Saint Elias Mountains. The character of the ranges varies considerably, from the record-setting tidewater glaciers in the ranges of Alaska, to the rugged Central and Southern California ranges, the Transverse Ranges and Peninsular Ranges, in the chaparral and woodlands ecoregion with Oak Woodland, Chaparral shrub forest or Coastal sage scrub-covering them. The coastline is often dropping steeply into the sea with photogenic views. Along the British Columbia and Alaska coast, the mountains intermix with the sea in a complex maze of fjords, with thousands of islands. Off the Southern California coast the Channel Islands archipelago of the Santa Monica Mountains extends for 160 miles (260 km). There are coastal plains at the mouths of rivers that have punched through the mountains spreading sediments, most notably at the Copper River in Alaska, the Fraser River in British Columbia, and the Columbia River between Washington and Oregon. In California: the Sacramento and San Joaquin Rivers' San Francisco Bay, the Santa Clara River's Oxnard Plain (home to some of the most fertile soil in the world), the Los Angeles, San Gabriel, and Santa Ana Rivers' Los Angeles Basin - a coastal sediment-filled plain between the peninsular and transverse ranges with sediment in the basin up to 6 miles (10 km) deep, and the San Diego River's Mission Bay. From the vicinity of San Francisco Bay north, it is common in winter for cool unstable air masses from the Gulf of Alaska to make landfall in one of the Coast Ranges, resulting in heavy precipitation, both as rain and snow, especially on their western slopes. The same Winter weather occurs with less frequency and precipitation in Southern California, with the mountains' western faces and peaks causing an eastward rainshadow that produces the arid desert regions. Omitted from the list below, but often included is the Sierra Nevada, a major mountain range of eastern California that is separated by the Central Valley over much of its length from the California Coast Ranges and the Transverse Ranges. On the West coast of North America, the coast ranges and the coastal plain form the margin. Most of the land is made of terranes that have been accreted onto the margin. In the north, the insular belt is an accreted terrane, forming the margin. This belt extends from the Wrangellia Terrane in Alaska to the Chilliwack group of Canada. A rupture in Rodinia 750 million years ago formed a passive margin in the eastern Pacific Northwest. The breakup of Pangea 200 million years ago began the westward movement of the North American plate, creating an active margin on the western continent. As the continent drifted West, terranes were accreted onto the west coast. The timing of the accretion of the insular belt is uncertain, although the closure did not occur until at least 115 million years ago. Other Mesozoic terranes that accreted onto the continent include the Klamath Mountains, the Sierra Nevada, and the Guerrero super-terrane of western Mexico. 80 to 90 million years ago the subducting Farallon plate split and formed the Kula Plate to the North. This formed an area in what is now Northern California, where the plates converged forming a Mélange. North of this was the Columbia Embayment, where the continental margin was east of the surrounding areas. Many of the major batholiths date from the late Cretaceous. As the Laramide Orogeny ended around 48 million years ago, the accretion of the Siletzia terrane began in the Pacific Northwest. This began the volcanic activity in the Cascadia subduction zone, forming the modern Cascade Range, and lasted into the Miocene. Events here may relate to the ignimbrite flare-up of the southern Basin and Range. As extension in the Basin and Range Province slowed by a change in North American Plate movement circa 7 to 8 Million years ago, rifting began on the Gulf of California. Although many of the ranges do share a common geologic history, the Pacific Coast Ranges province is not defined by geology, but rather by geography. Many of the various ranges are composed of distinct forms of rock from many different periods of geological time from the Precambrian in parts of the Little San Bernardino Mountains to 10,000-year-old rock in the Cascade Range. 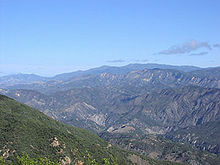 For one example, the Peninsular Ranges, composed of Mesozoic batholitic rock, are geologically extremely different from the San Bernardino Mountains, composed of a mix of Precambrian metamorphic rock and Cenozoic sedimentary rock. However, both are considered part of the Pacific Coast Ranges due to their proximity and similar economic and social impact on surrounding communities. These are not named as ranges, but amount to the same thing. 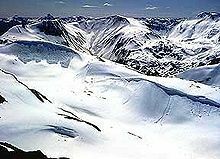 The Pacific Coast Ranges are home to the largest temperate-latitude icefields in the world. ^ Merriam-Webster's collegiate encyclopedia, page 361 (Merriam-Webster, 2000). ^ S. Holland, Landforms of British Columbia, BC Govt. 1976. ^ "Coast Ranges". Geographic Names Information System. United States Geological Survey. Retrieved 2007-07-30. ^ "Pacific mountain system". Britannica Online Encyclopedia. Encyclopædia Britannica. Retrieved 2007-09-29. ^ a b c d Townsend, Catherine; Figge, John (2002). "Northwest Origins". The Burke Museum. ^ a b Dickinson, William (2004). "Evolution of the North American Cordillera" (PDF). Annual Review of Earth and Planetary Sciences. 32: 13–45. doi:10.1146/annurev.earth.32.101802.120257. Archived from the original (PDF) on 4 January 2014. Retrieved 9 April 2013. ^ a b Humphreys, Eugene (2009). "Relation of flat subduction to magmatism and deformation in the Western United States". GSA.